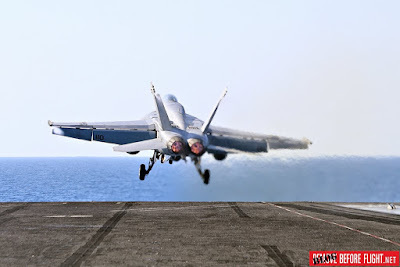 Chapter One: The nuclear-powered Nimitz-class aircraft carrier launches massive air ops from the Mediterranean Sea to fight the Islamic State of Iraq and Syria (ISIS). On January 21, 2017 the George H.W. Bush Carrier Strike Group (GHWBCSG) departed from Norfolk and Mayport for a regularly-scheduled deployment. It is part of a regular rotation of forces to support maritime security operations, provide crisis response capability, increase theater security cooperation and forward naval presence in the 5th and 6th Fleet areas of operation. Led by Commander, Carrier Strike Group 2, Rear Adm. Kenneth R. Whitesell, the GHWBCSG is comprised of the staff of CSG-2; USS George H.W. 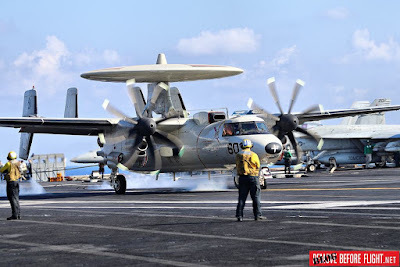 Bush (CVN 77); the nine squadrons and staff of Carrier Air Wing (CVW) 8; Destroyer Squadron (DESRON) 22 staff and guided-missile destroyers USS Laboon (DDG 58) and USS Truxtun (DDG 103); and Mayport-based guided missile cruisers USS Philippine Sea (CG 58) and USS Hue City (CG 66). 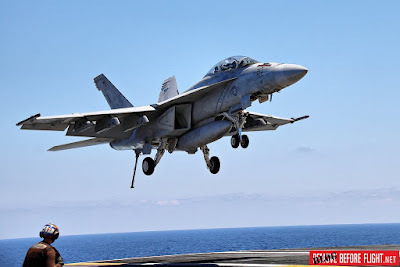 The squadrons of CVW-8 came from different air bases including Naval Air Station (NAS) Oceana, NAS Whidbey Island, NAS Jacksonville, NAS Lemoore and Naval Station Norfolk. CVW-8 includes Strike Fighter Squadron (VFA) 213 "Fighting Black Lions"; VFA-31 "Tomcatters"; VFA-87 "Golden Warriors"; VFA-37 "Ragin Bulls"; Electronic Attack Squadron (VAQ) 131 "Lancers"; Early Warning Squadron (VAW) 124 "Bear Aces"; Helicopter Mine Countermeasure Squadron (HSM) 70 "Spartans"; Helicopter Sea Combat Squadron (HSC) 9 "Tridents"; and a detachment from Fleet Logistics Support Squadron (VRC) 40 "Rawhides". USS George H.W. 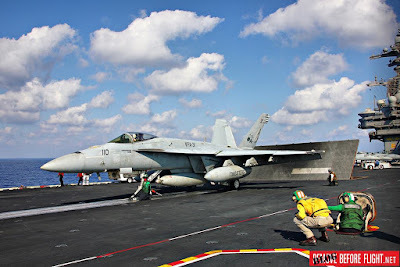 Bush (CVN-77) is the tenth and final Nimitz-class aicraft carrier of the U.S. Navy. She is named for the 41st President of the United States and former Director of Central Intelligence George H.W. Bush, who was a naval aviator during World War II. George H.W. Bush measures 1,092 feet (333 m) and displaces over 100,000 tons, making her one of the world's largest warships. 47,000 tons of structural steel and about 500 tons of aluminium make up a ship with the same length as Empire State Building powered by two nuclear reactors that can operate for more than 20 years without refueling. She can reach a top speed of 30 knots (about 55 kms/h). Four catapults can launch in a short time several of the 80 aircraft embarked. The George H.W. 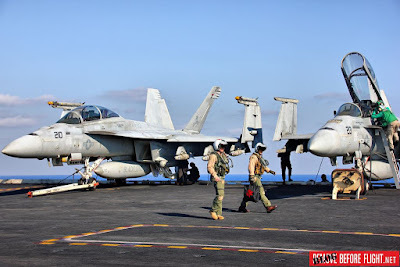 Bush Carrier Strike Group (CSG) is currently launching missions against the Islamic State of Iraq and Syria (ISIS) in support of Operation Inherent Resolve (OIR) from the Mediterranean Sea. 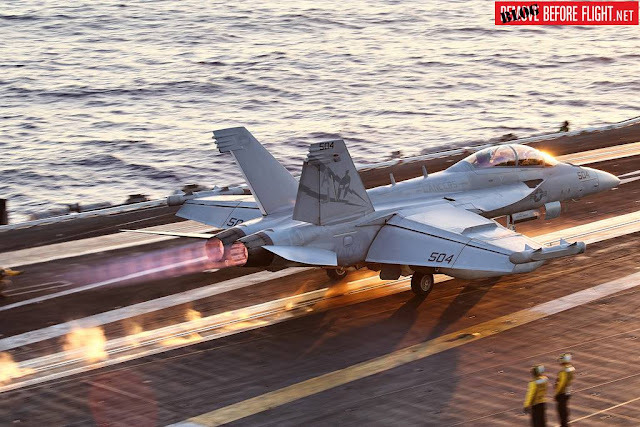 The CSG entered the Mediterranean Sea June 5, after conducting operations from the Eastern Mediterranean Sea, in the U.S. 5th Fleet area. The GHWBCSG operations in the Eastern Mediterranean Sea demonstrate the capability of the U.S. Navy to conduct precision strikes on ISIS targets from multiple theaters, highlighting the flexibility of the Navy's globally deployed force. Many enemy targets have been destroyed from the beginning of the deployment to date, including the last shoot-down of a Syrian SU-22 by a Super Hornet. According to a Combined Joint Task Force for Operation Inherent Resolve media release the fact happened on June 18. 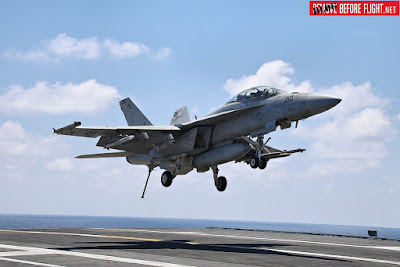 At 6:43 p.m. a Syrian regime SU-22 dropped bombs near SDF fighters south of Tabqah and, in accordance with rules of engagement and in collective self-defense of Coalition partnered forces, was immediately shot down by a U.S. F/A-18E Super Hornet. During our recent visit aboard GHWB we had the opportunity to meet the Commanding Officer CAPT Will Pennington. He has deployed eight times aboard five different carriers and has more than 3,500 flight hours in F-14 and FA-18 fighter jets. He was also assigned to the F-14 Fleet Replacement Squadron, where he served as an instructor pilot, training officer, and flight demonstration pilot. We have asked to him about past, present and future. 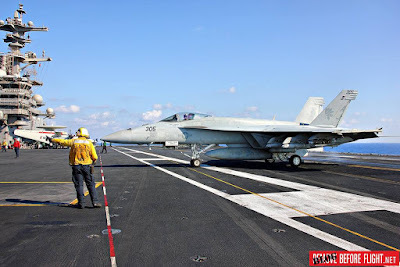 Which plane is better between Tomcat and Super Hornet? Which one did you excite more? The F-14 is now part of the past, looking to the future, when the F-35C will be delivered to the US Navy? - This is an operation that will involve more States, in California there are Navy and Air Force together to train the first F-35 Squadron and I think it may be operational by the end of next year. Which aircraft will replace the F-35C? 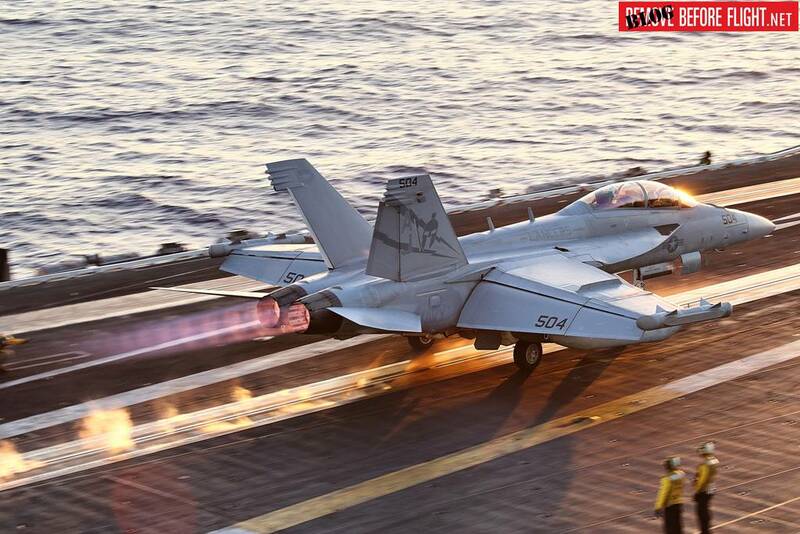 - The JSF will replace all Hornets and older Super Hornets. At the beginning we will have aboard GHWB a Squadron of F-35C and three Squadrons of Super Hornets. 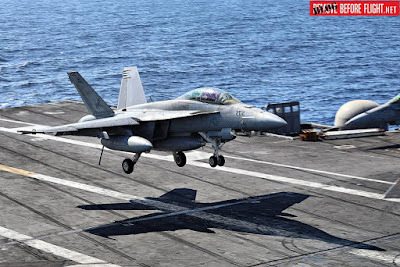 What about Operation Inherent Resolve? - Many nations are in coalition, so it is very complicated, it is been a long fight, being here is a very important and a honor, we are expecting to be free very soon. The aircraft carrier is a complex structure that is operated excellently by all the sailors: dozens of takeoffs and landings continue uninterrupted day and night and everything works great! 6,000 sailors all perfectly trained and synchronized to carry out their task: from the fighter pilot to the cleaner, every role is done in the best way. 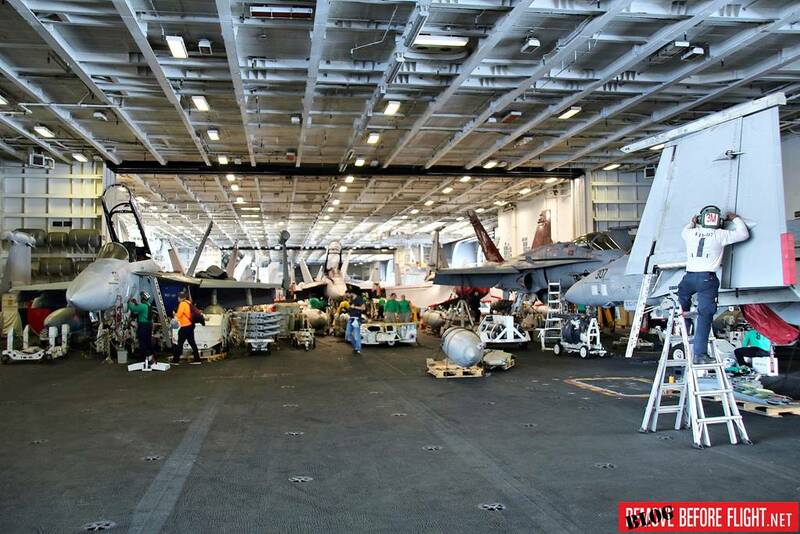 Under the flight deck there is the aircraft maintenance hangar where there are dozens of aircraft ready to be checked. The organization is perfect as usual. When you enter a carrier you perceive a different atmosphere than usual: rigor, discipline, job passion and respect. It is not common to feel all of this in a few moments. That made US Navy great! Thanks to all the personnel of the U.S. Navy who allowed and supported us in the realization of this reportage.